Q: My mother is a Mormon, I am not. I have been asked to get things in order. I would like her religion to do the funeral. Who do I see? Great question. The bishop (ecclesiastical leader) of the local ward (congregation) can help you. You can find who the bishop of your mother’s ward is by going to this link, https://www.lds.org/locations?lang=eng Click on the “find a meetinghouse” link. From there you can input your mother’s home address and it will list which ward your mother’s address is in as well as the bishop of her ward. Contact this man. While you are on this website, feel free to look around. You may find some things that you find comforting. We appreciate your interest. Our condolences to you and your family. Q. What happens if I feel like I don’t belong in the Celestial Kingdom? A. If my friend*, Johnny Depp, invited me to a red carpet event, I would feel out of place. Even if everyone knew I was there with him, and that I could be there–I would still be completely uncomfortable. Even if I tried to blend in with a designer dress and shellacked hair, I would feel like everyone knew that I was an imposter. I’m a housewife, for goodness sake! In a similar way, in order to feel like we belong in heaven, we have to be worthy and we have to have confidence in our presence there. The first obstacle is that we aren’t worthy. We are mortal, God is immortal. We are flawed, He is perfect. We are dull, His glory would blind us. We are soiled with sin and hatred. He is clean and full of love. We truly don’t belong there. And if it was just up to us, we would never get there. For this very reason, God sent His Son to bridge the chasm separating us from our Creator. Jesus Christ can take us to immortality, perfection and sinless glory. He can make us heavenly. It is up to us to accept His help. That’s it. To be humble in acknowledging our utter dependence on Him in taking us from our current state to feeling comfortable in His presence. There is no sin so bad that He can’t atone for it. He can take the blackest soul and wash it clean–if we will let Him. He forgave Zeezrom after Zeezrom’s arguments resulted in a group of women and children being killed by fire. (Alma 14). Surely, you have done less than that. 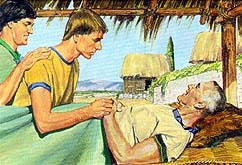 He forgave Paul after Paul assisted some others in stoning Stephen to death. 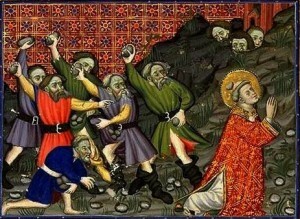 Stephen was Christ’s own apostle. Surely, you have done less than that. He wants to help us and forgive us. That’s what He is all about. This tells us how to acquire the confidence necessary for us to stand in the presence of the Lord (without shrinking or sweating). 1) Be charitable towards everyone. Be kind, watch for ways to help those around you. Pretend you are an angel, always on an errand of the Lord. Not only towards strangers, but members of your congregation at church (the household of faith). 2) Let virtue garnish your thoughts unceasingly. Think good, clean thoughts. Be happy and optimistic. Be grateful for things you have. Virtuous thoughts are in line with the commandments. Follow the teachings of the prophets, and look for ways to be obedient to the counsel that God has given us. If you live this kind of loving, happy life, it makes you a loving person–a person like Christ. You start to feel more comfortable around the valiant. In my church meeting on Sunday, the speaker talked about people who don’t want to be thought of as too “churchy”. They like to stay up on the latest trends, and give their devotion half-heartedly on Sundays so that they aren’t seen as the archetypal Molly Mormon. They are cooler than that. But what usually happens when a person tries to keep one foot in the world and the other in the Kingdom of God, is that they get pulled toward the world and away from the church. He observed that even if “churchy” people seem overzealous, heaven is full of “churchy” people. And the more you get to know them and become like them, the more familiar heaven will be. Even if you don’t feel like you would fit in there now, you are made of heavenly stuff. It is your eternal heritage and your eternal inheritance. The whole plan is designed to ensure that we return to our Father in Heaven–better, stronger, and smarter than we were when we left. Have confidence in that plan, too. *I feel like Johnny Depp and I could be friends, given the chance. Do Mormons believe in the Second Coming? Someone asked us: Yes or No answer please. 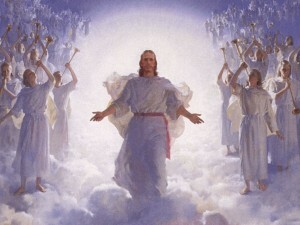 Do Mormons believe in the second coming of Christ? Comments Off on Do Mormons believe in the Second Coming? In the Old Testament Job was put through some testing when God gave permission to Satan to test Job’s resolve. After losing his fortune, his family, and his health, he was further plagued by his supposed friends who came over to question him about what he had done wrong to warrant such trials. After about 40 chapters of arguing, with his friends and even his wife urging him to “curse God and die”, the Lord himself interjects into the dialogue with what some might regard as a rather terse explanation. In Job 40:7-8 “Gird up thy loins now like a man: I will demand of thee and declare thou unto me” “Wilt thou disannul my judgment? Wilt thou condemn me, that thou mayest be righteous? He then goes on to explain how we mortals can’t understand the majesty and design of God. It seems to me that the path to greater peace in your life might be in turning MORE to God and trusting deeper in Him, rather than in being mad at him for the trials that are surrounding you. A suggestion is to go to the Lord in prayer and thank him for your trials. This might take a bit of a change in your thinking but from personal experience when I have tried this I have been given insight into what the bigger plan might be. His inspiration has also helped me recognize the source of the problem and given me insight as to how to deal with it. It also calms my troubled heart and allows me to caste my burdens on the Lord-and continue on with the job of doing good and helping others. Keep up the good fight but rather than cursing God, hasten to his throne and be blest by his eternal goodness. Q: Do Mormons believe in organ donation? A: We certainly do. We wrote some posts about organ donation and cremation a couple of years ago. Check them out.